I've always been obsessed with tree houses, probably because I never had one. That being said, I couldn't stop looking at these bizarre structures at the very tippy-top of the trees. 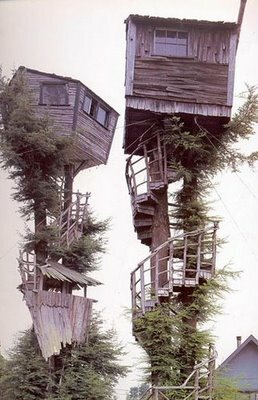 For more cool tree houses, check out the rest of those on the Now That's Nifty post of Amazing and Awesome Tree Houses. Where is the Big Treehouse in Marshalltown, Iowa? My former teacher Mick Jurgensen has been building it for years. He used to bring the blueprints to class. Yeah, some image credits and location info would nice. I always wanted a tree house but not a show. I wonder why Now That's Nifty Blog doesn't weave a narrative and their sources into the post itself ... they've got great post ideas that often just end up as an aggregate of photos or a copypasta job from Wikipedia. It's too bad.